Today we picked up an oldie and a goldie, Jesus Christ Superstar. Partly inspired by watching our favorite philosophical masala movie, Chor Sipahee, with Beth, and partly by our continued annoyance that Siddartha - which stars Shashi Kapoor as Siddartha Gautama and ergo must be, like, the mostest greatest movie ever - should still remain at an obnoxiously priced $20+, we were in the mood for (1) something 70s, (2) something (pseudo) religious, (3) something with hotties and (4) something with fab music. Jesus Christ Superstar has all this, and more! For those that don't know the story of Jesus, we'll point you to the most reliable source: Wikipedia. When not admiring Caiaphas' enormous hat, we wondered about his plastic jewel-encrusted Darth Vader chest panel. JCS picks up the story during the period right before his crucixion. 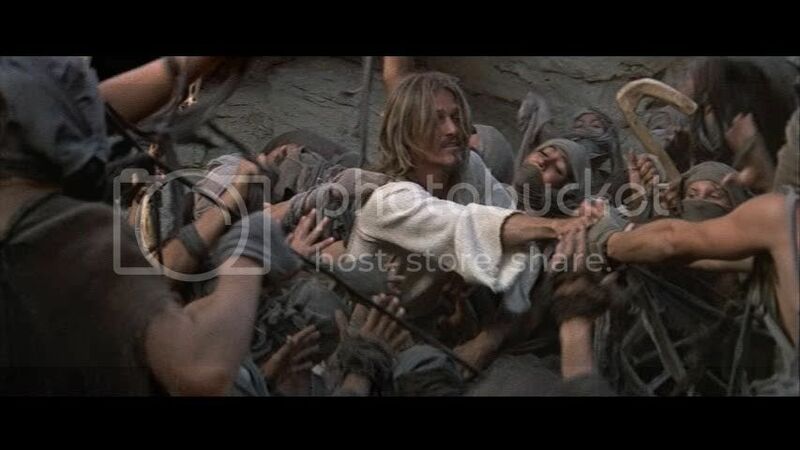 Told from the perspective of a tortured and indignant Judas (Carl Anderson), we are introduced to Jesus (Ted Neeley, looking a lot like Tadanobu Asano from Mongol and the PPCCed Zatoichi) and his posse of fit, good-looking disciples. Judas, being Judas, is not so accepting of Jesus' devotee, Mary Magdalene (Yvonne Elliman), and Judas is also worried about the unwieldy cultish devotion Jesus is starting to inspire in his followers. Indeed, an excellent song performed by Simon (Larry Marshall) and the zealots captures this dizzying, uncontrolled vibe very well. The lyrics, too, are tongue-in-cheek humorous and scary at the same time, much like many of the crowd scenes in the film: "Christ, you know I love you! Did you see? I waved! I believe in you and God, so tell me that I'm saved!" Themes of crazy mob mentality and cults of personality! After the famous tantrum in the temple, the famous healing of the lepers, the infamous betrayal by Judas, and the famous Last Supper, we arrive at the inevitable climax: Jesus is arrested and carted before the various rulers of turn-of-the-millennium Judea. 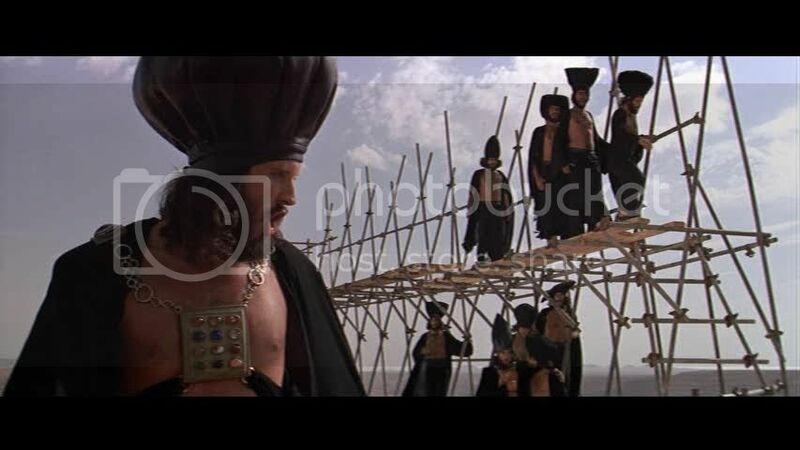 These are the grim rabbis, super-bass Caiaphas (Bob Bingham) and super-tenor Annas (Kurt Yaghjian), the zany and debauched King Herod (Josh Mostel, son of Zero), and the tortured and sympathetic Pontius Pilate (Barry Dennen). Over Pilate's protests, Jesus is crucified. The most zany, over-the-top camp King Herod you done ever saw. 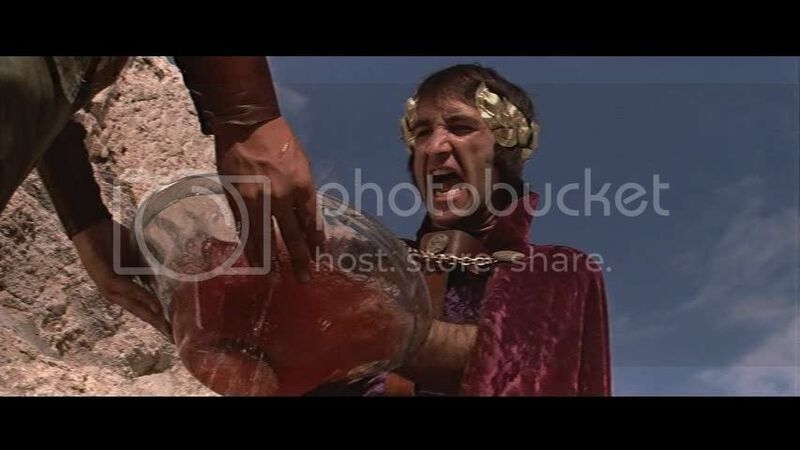 "Don't let me stop your great self-destruction," sings Pilate. I can see where we all soon will be. You will see where we all soon will be. Jesus! Than the things you say. 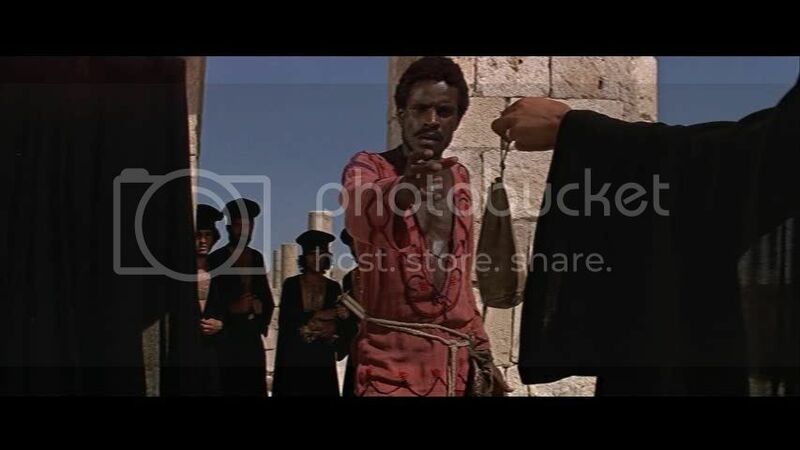 Carl Anderson really makes the movie with his totally awesome Judas. But is it offensive that Jesus is your usual Tuscan-style blue-eyed cliché, while the biggest villain in the New Testament is played by a black man? Hmmm. Another interesting theme is the contextual relevance. There are lots of references to the occupation of Judea by the Romans, Jesus' potential as a guerrilla leader, and (literal) underground meetings. In true counterculture 70s style, the apostles are all sensitive, shaggy-haired hippies, while the authority figures range from buffoonish (Herod) to spineless (Pilate). We have some interesting and weird militaristic imagery: ubiquitous machine guns, as well as cameos by tanks and jets. 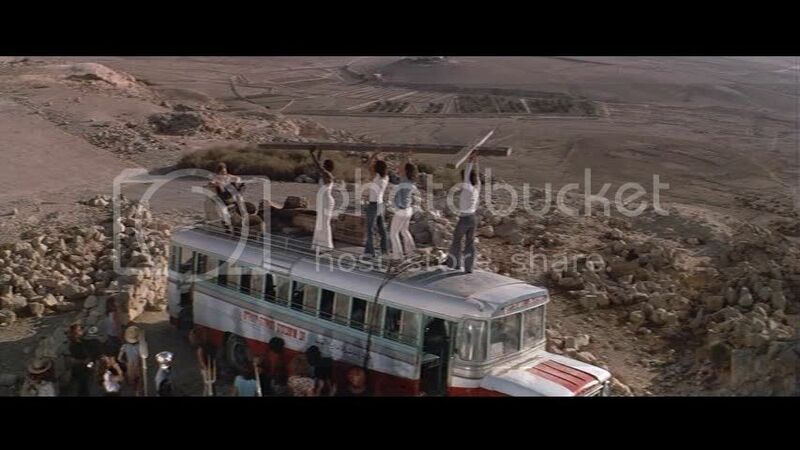 Given that JCS was filmed on location in Israel, and given that this was only five years after the Six-Day War, the PPCC's antennae immediately perked up, ready to receive any interesting, geopolitical statement the movie cared to send. Well, apart from hippies are cool and authority is bad, we didn't get anything else. Alas. Anyway, going back to the mob control theme, it also got us thinking about whirling dervishes, zealotry, mysticism and other forms of really crazy worship of the divine. All the performances in JCS are full-on passionate, and they present a form of grass-roots Christianity which is bursting with energy. In her excellent book, A History of God, Karen Armstrong traces the three Abrahamic religions and notes that Western Christianity never really got its mysticism going - not in the same way Islam, Judaism and the Orthodox church did. In JCS, however, we see a proto-Christianity, still before any establishment of the Vatican as a new authority figure. And the music for Simon and the zealots' reminded us of gospel music from the American South - we started thinking perhaps the whole speaking-in-tongues, Southern Baptist, healer/preacher/etc. movement approximates mysticism very closely. All very interesting! Onto more superficial matters. All the performers were wonderfully talented and, well, incredibly fit. What dancing! Not an ounce of fat! Wowee. Webber's music is great and - from start to finish - this is one of our favorite soundtracks. Imagine lots of fuzzy guitars, creepy choirs and shrieking, 70s rock band vocals (indeed, most of the performers were not Broadway people but rather were rock band people). Tim Rice's lyrics are always wonderfully fun; he manages to be both snarky ("One thing I'll say about him, Jesus is cool," sings Caiaphas) and deep, weaving together Biblical-sounding language with modern slang ("God, thy will is hard, but you hold every card," sings Jesus). He also has a cunning ability to make "Christ!" sound both like the modern exclamation and like, well, saying someone's name. Shout-out to the internet: The guy on the left has only one line ("Have your men proved at all worthwhile? "), but we've always loved him as he's got a great voice, a cool shirt, and a cool haircut. But who is the "Have you men proved at all worthwhile?" Guy? We call on the powers of the internet! Overall, a very fun time to be had. Highly recommended by your friends at the PPCC. Why is it that reading your posts sometimes I get the feeling that I'm reading something I just haven't written yet. JCS AND a namecheck for Karen Armstrong? You're talking my language. Also, when I first scanned the opening, I thought you wrote the "Humble" Andrew Lloyd Webber, which would have been hilarious, because he's not. I can't help thinking that Herod looks a lot like Richard Simmons. That's certainly going to color my view of the New Testament. "Have your men proved at all worthwhile?" is a very, very important question, especially for those of us in a freak-out fundamentalist/evangelical/"family values" culture. Saw the movie later and loved it, although I still like the original recording better. This sounds fabulous - have always wanted to see a film on Christ and this one has tons of singing as well. Am not sure about the buses and machine-guns, though - surely Christ doesnt need those! Hold strong PPCC, and continue to steer clear of Siddhartha. If you have read the book and liked it, you wont like the movie inspite of Shashi. There is tons of gratuitous Orientalism and bad acting! I invested $20+ and live to regret it! Beth - Indeed, the film's so timely for today's evangelist revival culture! Memsaab - I think I might have heard the original recording, but I can't remember it anymore as it was years ago. Anyway, it's such great music, and I love how they used screaming rock singers, too! Bollyviewer - This is definitely an excellent intro to Jesus. I kid you not, they use it in some Sunday schools. I am trying - TRYING - not to get Siddartha. I didn't care for the book, and obviously I don't care for cheesy hippie Orientalism, but... gosh, a semi-Buddhist movie with Shashi?! How can I resist?! Wonderful article, Jesus Christ Superstar is my favorite film ever, since I was 6. By the way, I'm pretty sure that the guy who really sings "Have your men proved at all worthwhile?" is Peter (Philip Toubus, aka Paul Thomas), not the guy in the pic you posted. I think the same was done with the man who sings in that scene "Do you plan to put up a fight?" (the second one), I'm sure it's Bob Bingham (Caiaphas) who sings that line. Moreover, that last guy is also the soldier in "Peter's Denial", what a cast! Does anyone know who the blond apostle with the pink trousers is?